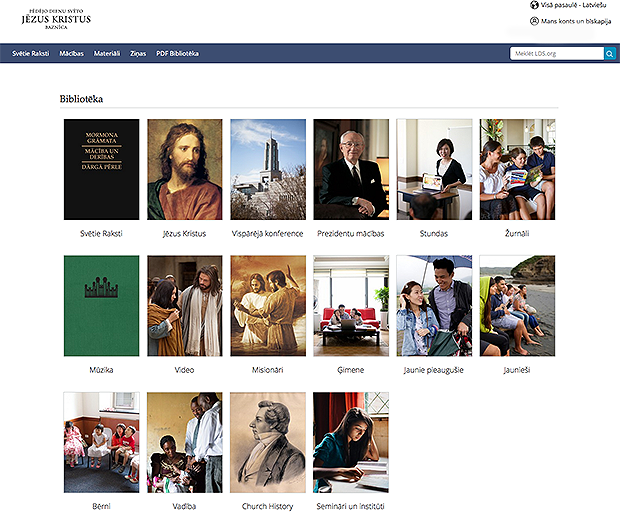 The Church has redesigned the language pages on LDS.org to mirror the Gospel Library app. The same Church resources—such as scriptures, lesson manuals, general conference talks, and Church magazines—are now available on LDS.org and in the Gospel Library app in 115 languages. Now you navigate on the LDS.org language pages just like you do on the Gospel Library app. To access a specific language page, simply click the world globe icon in the upper right corner of LDS.org. Then click the language icon. This will take you to a page with a large list of all the languages currently supported on LDS.org. Select the desired language from the list, and you will be directed to the new language page. Clicking on the major languages (Chinese, English, French, German, Italian, Japanese, Korean, Portuguese, Russian, and Spanish) will take you to the full LDS.org, rather than the language pages as explained above. Also, note that a few languages still show the old format on the page until some of the materials that were only in PDF format can be converted to text. A future enhancement to the language pages will include the ability to highlight and annotate text, like you can already in the major languages on LDS.org. If you have any suggestions or problems with these pages, please use the feedback link at the bottom of the languages pages. A family in Latvia uses a computer to access LDS Church materials in the Latvian language. Deen, the Church does not offer an audio version of the scriptures in German or Italian.